Since we sell our chops boneless the whole rib is trimmed out. This allows us to have three different rib cuts - back ribs, spare ribs, and country style ribs. 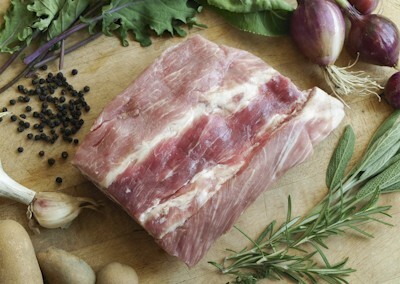 Back ribs are a small cut that comes off the chops. They're still every bit as delicious as the other rib cuts, just they're not really meaty. Learn more about how we raise our pigs on the pastured pork page.